The Indiana personal injury law of Glen Lerner Injury Attorneys is a 2018 title sponsor of Indiana’s oldest county fair located in LaPorte, IN. “At Glen Lerner Injury Attorneys, we love to take part in local events that bring communities together. Because of this our Merrillville legal team has looked forward to supporting the 2018 LaPorte County Fair.” -- Glen Lerner, ESQ. 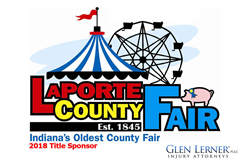 Glen Lerner Injury Attorneys announce their sponsorship of Indiana’s oldest county fair, the LaPorte County Fair in LaPorte, IN (2581 W. State Rd. 2, LaPorte, IN 46350). Fairgoers have until July 14th to enjoy all of the activities and entertainment that begin daily at 8 am. The law firm’s Merrillville team members are excited to have an on-site booth July 12th - 14th to meet and mingle with locals. LaPorte County Fair events and activities include 4-H competitions, a variety of animal shows, wood carver demonstrations, carnival rides, all American pig racing and so much more! Grandstand performances are scheduled for July 12th and July 14th with country favorites taking center stage to include: Joe Diffie, Pat Green, in addition to Kane Penny with special guest Mitchell Tenpenny. For more details regarding ticket purchases, fair schedule, parking and camping, go to lpfair.com or, send questions via email to laportefair(at)gmail(dot)com. For those that do plan to attend and will leave in the evening, the personal injury attorneys encourage drivers to be alert and pay attention to surroundings to help avoid any injuries or car wrecks. Distracted drivers, night driving and inexperienced teen drivers can contribute to potential driving risks to and from the fair. Remain visible - make sure other drivers can see you. Properly maintain your vehicle - especially check vehicle tire pressure and fluids. Avoid distractions (texting, loud music, live streaming, etc. ).